The following is a guest post from Cia Arielle at Cia Pink Pumpkin. Anytime you play hostess in your home, especially around the holidays, the prospect can be overwhelming. You want your guests to enter a clean, warm, clutter free home and experience great food and company. Hopefully they will leave content, with such a good impression that they look forward to receiving another invitation from you. Easier said than done, isn’t it? To create that kind of experience for your guests you truly must address every single detail possible, and I’m here to help with some often overlooked details… Scent. When it comes down to it, a well planned party will address each of the five sense- sight, taste, touch, sound, and scent. You’ll get sight by having a clean and well lit home. Taste is obviously addressed with a well planned spread of food. Touch will be taken care of with plenty of comfortable seating and a home that is not too hot or cold. Sound is easy enough by turning on some pleasant background music. But smell is the forgotten piece of the puzzle. What fragrances do you pick? You don't want the same fragrance throughout the whole house, nor do you want fragrances that clash. Everything needs to make a cohesive statement without being overwhelming. 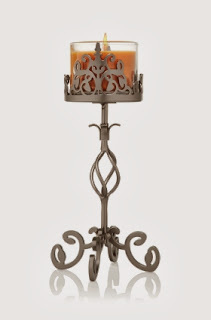 For your entrance area and den/man cave I would recommend neutral fragrances. Some of my favorites from this year's collection include Vanilla Cedarwood, Mahogany Teakwood, and Applewood Bonfire. These are all clean, yet slightly smokey fragrances with a very warm and subtle feel. For the bathroom it's always nice to coordinate something where you can match the fragrance and soap together. If you're into pumpkins I would recommend Pumpkin Caramel Latte, Sweet Cinnamon Pumpkin, or Pumpkin Cupcake. They all come in both candles and soaps. Don't forget to pair with an adorable illuminary and soap sleeve! For the dining room, subtlety is key. You don't want a strong fragrance that will overwhelm your guests and possibly affect the flavor of the food. Cider Lane, Marshmallow Fireside, and Apple Ale are all perfect selections. 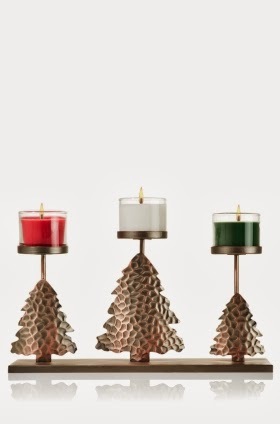 You can do a large 3 Wick candle, but for such a decorative room I feel this adorable holder with three mini candles would be best. A full size sanitizer near the food is a great way to encourage your guests to spread love, not germs! Since the kitchen and living room are in such close proximity to each other, I think the fragrances need to be well coordinated if not the same for these two areas. My favorite fragrance for Thanksgiving is Leaves, which comes in the traditional Bath and Body Works brand as well as White Barn (the difference being that the White Barn is lighter). Other fragrances that would be good for these areas include Spiced Apple Toddy, Hot Buttered Rum, and Pumpkin Carving. These fragrances are all not only delicious, but very strong. If you want to get the absolute best deal on these at Bath and Body Works, don't forget to use your coupons with the sales! The 3 Wick Candles are 2/$22 through November 13. Make your purchase in store and you'll receive a Holiday Gift Guide with three coupons in the front page... Free item up to $13 with any $15 purchase, $10 off $30, and 20% off. Cia Arielle is a 23 year old fragrance obsessed bride to be living in the heart of America. This week I am pleased to say Cia is offering this Exclusive Bath and Body Works Test Candle (carried in select stores only through Fall 2013) featuring three top selling fragrances- Creamy Pumpkin, Sweet Cinnamon Pumpkin, and Roasted Pumpkin Butter. Contest ends next Thursday! My favorite seasonal scent is twisted peppermint. Yum! Total reminds me of Christmas! Tiff, Twisted Peppermint is fantastic! Don't forget to try the other two amazing Christmas "Mints" this year... Buttercream Mint and Mint Chocolate! They'll make your mouth water! I hope you two got to see the entire Pumpkin line they did this year! Pumpkin Apple, Pumpkin Caramel Latte, Pumpkin Blueberry Patch, Pumpkin Pecan Waffles, Pumpkin Carving, Pumpkin Hayride, Creamy Pumpkin, Pumpkin Carrot Cake, Pumpkin Cupcake... It was kind of awesome! Favorite seasonal scent is anything with apple. I must confess cinnamon Apple is my ultimate favorite scent of all. You two would love Leaves then! Golden nectar, juicy mandarin and red apples spiced with cinnamon and harvest berries. It's a best seller every year. Frosted Gingerbread is coming back this year as a Holiday Tradition candle!!! In addition to that it'll be out in handsoap as Iced Gingerbread! Finally pop into Victoria's Secret for Crystallized Ginger and Praline body care- it smells amazing! Check out the Pumpkin list above- most of them have been marked down to 50% off! Apple Spice is my favorite . Thank you for offering this giveaway! Thank YOU for stopping by. Come back next week for another giveaway. ;) Good luck! Robyn, sounds like Leaves would be good for you too! Winter Candy Apple is one of my favorites too! I have it in both body care and a candle! Make sure you try the Whipped Shimmer Body Cream, it's well worth $16! Steph, thank you so much for featuring me! 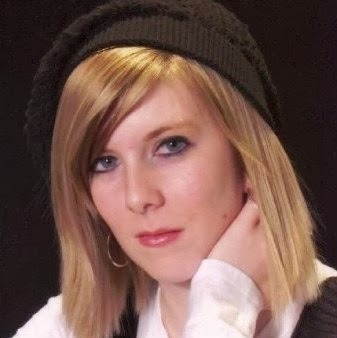 I hope I was able to recommend some excellent fragrances for you and your readers. 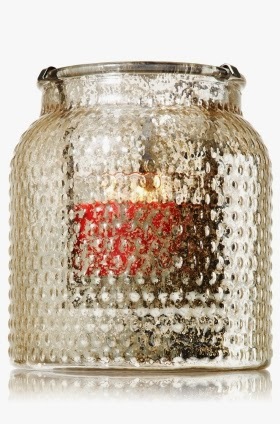 Note to all that today (Saturday, 11/9) select stores are doing $5 Mason Jar Candles, whereas they are normally $12.50. These candles are the perfect size for the bathroom, and two of them could probably handle your kitchen! I love the scent of the woods--anything pine, cedar, etc. Our house feels like a cave sometimes, so I really enjoy some of the outdoor scents too. I used to love Acorn and Fig from Bath and Body Works, but they don't make it anymore :( I love anything Pumpkin though! MidgeLidge the annoying thing at Bath and Body Works is that they repackage fragrances all the time with new names. They actually DO have Acorn and Fig, but now it's called Autumn Day. Lol there is one long ongoing candle they keep doing it with... It's going on it's 5th or 6th launch in 2 years. I love the Marshmallow Fireside scent. I'm so intrigued with that scent. I've never smelt it in person, but since reading Cia's post: want to soon. Pumpkin is mt fave seasonal scent. I know I would love the Sweet Cinnamon Pumpkin. Thanks for the great giveaway opportunity. Keep up the terrific blogging. I love cinnamon scents around this time. 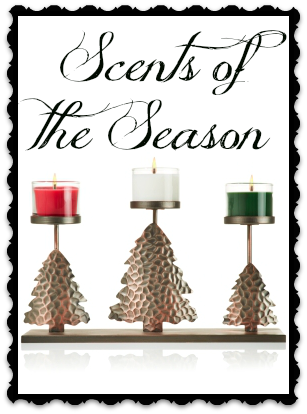 My favorite seasonal scents are pine and candy apple. I LOVE cranberry scented anything! I always burn some form of cinnamon this time of year. I totally understand. I was burning a sugar cookie candle once and my kids got their hopes up and thought I had done some baking. 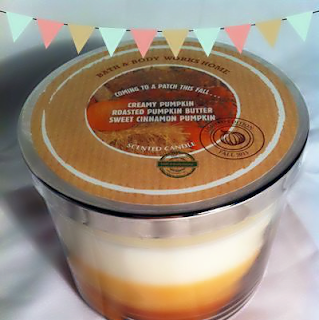 I love pumpkin and cinnamon scents. I love pretty much anything with cinnamon. Absolutely obsessed with anything pumpkin scented , I love all of the fall scents !! !